Every goddamn day: 04/22/19: Flashback 2010: "The rich subtlety of sign language will knock you out"
Flashback 2010: "The rich subtlety of sign language will knock you out"
On a dare from a reader, I wrote an obituary for myself four years ago, and posted it yesterday on Facebook, part of my routine of tossing up old blog entries on their anniversary to garner a few dozen extra clicks. The piece mentioned, among the stories I had written, one about translating a show tune into American Sign Language, and another reader, with a deaf child, said he'd like to read that. I remembered liking the piece and dug it up. You never know when the gray thunderheads of routine will part and a beam of something bright shine through; call it grace, beauty, whatever. Something that lingers. It isn't in the overheated, windowless office of the director of the International Center on Deafness & the Arts in Northbrook, listening to a detailed rendition of her career. Nor on a tour of the center. Nor seeing many photos of famous alumna Marlee Matlin. Nor even watching deaf students choreograph a dance from "West Side Story," being staged at the Centerlight Theatre this February. Just as I start wondering when I can politely grab my coat and bolt, we come into a cluttered work room. At a table sit Christine Erickson, the theater program director, Gina Matzkin, a costumer and longtime program participant, and a teenage girl, Lauren Holtz. Each has a ring binder open in front of her. They are in the midst of translating the lovely lyrics to "Somewhere" into American Sign Language. "Right now, we're struggling with the first two lines; 'There's a place for us/Somewhere, a place for us,' " says Erickson. "We're trying to give that a really nice picture." There is no American Sign Language sheet music for "West Side Story." Translating word-for-word doesn't work, because ASL is not a mere visual approximation of English, but a distinct language (popular, too -- about as many Americans speak ASL as speak Italian). "The words, 'There's a place for us,' " says Erickson. "The girl singing the song is not talking about it being for her and somebody else. What we're trying to figure out is, should she be signing 'us' meaning 'me and you,' or for 'them,' Tony and Maria, or for 'all of us.' It gets complicated." That it does. Take the third line, "Peace and quiet and open air." "This is going to be tricky. 'Peace' and 'quiet' are the same sign," explains Erickson, dusting her hands together and then spreading them apart, palms down. "I would prefer to keep 'peace' and do something else for 'quiet,' " Erickson says, suggesting the index-finger-to-lips gesture librarians are famous for, one that means, unsurprisingly, "hush" in ASL. "I like it," says Matzkin. Then there is the matter of keeping up with the beat. "Take my hand" is three syllables. The ASL symbol—one hand clapped over the other at your sternum —is one beat. The solution: break the gesture into three separate parts; the lower hand is presented, the upper hand claps over it, and the pair are drawn to the chest: Take my hand. "'Time to look, time to care,'—what does that mean?" asks Lauren, 15. "Life goes by so fast," says Erickson, shifting gears. "You have to stop, look around, spend time with the people you care about. What do you think it means?" We get into a discussion of ASL. There are regional accents—"Halloween," is signed differently in different parts of the country. People can sign loudly, softly, gently, strong. Men sign differently than women. In spring 2009, they did "Grease," which has a song going over various car parts. "I had to go home and ask my husband," says Matzkin (both are deaf). She signs "pistons"—a vigorous gesture of two fists driving up and down. "Somewhere" ends with a plaintive "Somehow/Someday/ Somewhere." They puzzle. "You guys overuse the word 'some,' " Matzkin tells me (By "you guys" she means the hearing world. Deaf society is the most militant of the various groups with disabilities, and if anywhere here I give the impression that ASL is pretty, I apologize for the insult). They consider "True how, true day, true where." "I'm not in love with the 'true,' but it might work," says Matzkin. They end up with "Possible. Future. Out there"—each gesture a double pump that echoes the two syllables of "Somehow, someday, somewhere." "From the top," said Matzkin. Lauren stands up, an elfin girl in a purple leotard. The freshman at Hersey High School in Arlington Heights is a quick study, and nails the lyrics they have just worked out while the song plays on a boom box, gesturing faster than I can write it down: a finger to her lips for hush, signing "together" by making O's out of her thumbs and forefingers and locking them together, then the big finish. "Someday"—she signs "future," palm at her temple, then slicing out. "Somewhere"—she signs "out there," thrusting her right arm, straight out, then her left, a gesture of Evita-like triumph. That the above description does not drop your jaw in delight, if you are not struck by the moment's charm, the fault is mine, limited as I am to the written English language. If you saw Lauren Holtz sign "Somewhere" in ASL, you'd know what I mean. But we all must labor under our limitations. This weekend I saw the play "Tribes" in St. Louis. It is a play about a family that didn't allow their deaf son to learn sign language out of fear he would be isolated from the world at large. He falls for a girl who uses sign language, he is ecstatic to learn he has a tribe, and conflict ensues in the family. It's a beautiful play that gives a peek into the deaf community and it's nuances and politics. I can't get the play out of my head - to was that good - and this wonderful article allows me to continue to ponder a community that, until this weekend, was foreign to me. Delightful. And it really gives one a sense of the difficulty of translating intangible concepts from one language to another. I'm sure the translation of 90% of everyday conversation can be understood perfectly, but certain ideas are simply better said in one language than another, which is the reason that English has incorporated so many words from other languages, including sign language, into its lexicon. I just remembered - there is a scene in the play "Tribes" where the girl translates between English and sign language while the father criticizes the limitations of sign language - criticism that founders when we realize the remarkable poetic expression of the girls translation. Dramatic brilliance. 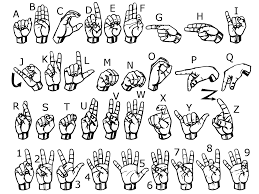 That chart showing hand signs for numbers and letters brings up old memories. One of my first jobs was working at a McDonalds. The fellow who owned it along with half a dozen other McDonalds was a bit of a jerk to say the least. Rule one, each store had to generate a 10% profit margin. Arriving containers of condiments were mixed with water to make them go further. Then an edict came down, employees on duty can't talk to each other, hard to coordinate work with that one. But one of the girls on our shift had a deaf relative and was fluent in ASL. So periodically she would sign thought the alphabet and numbers, after a few days people became proficient. It worked out well, especially when it got noisy during peak hours. I think her name was Nancy kept pushing us to go faster, and after a month began teaching some two handed signs. But all good things come to an end. Someone contacted the owner and wanted to present an award of recognition for hiring deaf employees. New edict no more sign language allowed..
Nicely done. In addition to a glimpse into the world of the deaf, a lesson in the difficulty of translation. Whenever a new translation of the Iliad or some other classic comes out I look forward to reading some expert comparing the pros and cons of different versions over the years -- sometimes the centuries. It also reminds me what a blessing the introduction a few years back of sur titles in opera houses has been. Translating vocal music from Italian, German, Russian. etc. is particularly difficult because a literal translation seldom fits the local line. "Opera in English" never really worked very well.